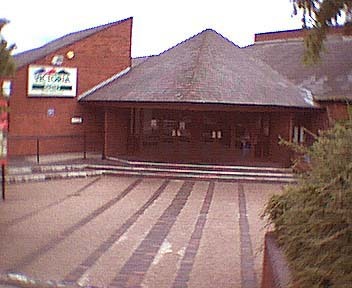 Victoria Leisure Centre also known as the Victoria Community Centre is situated on West St Crewe opposite the ASDA store. The Centre is also a school for some 750+pupils. The Leisure side has gained many honours over the years and as recently been awarded Investers In People and Charter Mark, this is not an individual award but as part of the Leisure Division. The School has recently been awarded Techincal College Status for the way the school teach I.T. Don't forget to write to the local paper the Guardian if you have any problems about exercise, all letters should be addressed to "Ask DONNA"
The Centre is also responsible for the Athletics track which has just been redeveloped with a new surface and markings, the area has now taken on a completly new appearance. There are plans to further develop the area now known as the Cumberland Arena, further improvements subject to finance would be lifting the infield to accomadate football, and astro turf the all weather pitch. Watch the local press etc for news on the revamped sports track. It should be great for all and an achievement for all concerned. The entrance to the centre is at present being changed by Cheshire County Council who own the buildings, a tree has been removed to make way for a lighter area which in turn should make the area safer. A shrub bed is taking its place and will allow clear vision from the walkway to the centre, better lighting has been provided giving the whole area an open feel.